Pat and Dan Stone first purchased their 132 acres of woods in Vermont in 2012. Pat had family roots in Vermont, and Dan had a hobby of woodworking. Together, they hoped the property would provide an escape from city living. On top of being a peaceful reprieve, they both had hopes to care for the land and improve places for wildlife to live and nest, but did not have extensive knowledge of land management. The Stones had heard stories from others about bad advice or poor logging jobs, so they wanted to make sure they found someone who could give them trusted professional advice. They did extensive online research of foresters and other professionals and conducted interviews with a few that stood out. When they met Kathy Beland and her business partner Frank Hudson, long time foresters with extensive experience in managing forests for wildlife, they immediately felt comfortable and hired them. During Kathy and Frank’s conversations with the Stones, they shared that while their land hadn’t been managed since the 1930s, it had good soil and potential to be ideal for birds and other wildlife. They helped the Stones discover that there were things they could do if they wanted their woods to provide better habitat, like removing the invasive species that were choking out the native plant life. They were surprised to hear that a harvest was actually good for bird and wildlife habitat. Energized by their newfound perspective, the Stones worked with Kathy and Frank to put together a management plan that would eventually include a harvest. Shortly after, Kathy shared that they were prime candidates to join the Vermont Tree Farm System, which would recognize their commitment to conservation and provide them with a community of other trusted professionals and landowners for more learning and common camaraderie. As Kathy told them about this opportunity, Dan remembered seeing a Tree Farm sign when he was a child and felt excited to get involved. Through Kathy, an active member of the Vermont Tree Farm System committee, the Stones learned about a new project between Vermont Tree Farm, the American Forest Foundation, and Audubon Vermont: Woods, Wildlife and Warblers. This joint effort focuses on working with landowners to improve bird and wildlife habitat across southern Vermont. 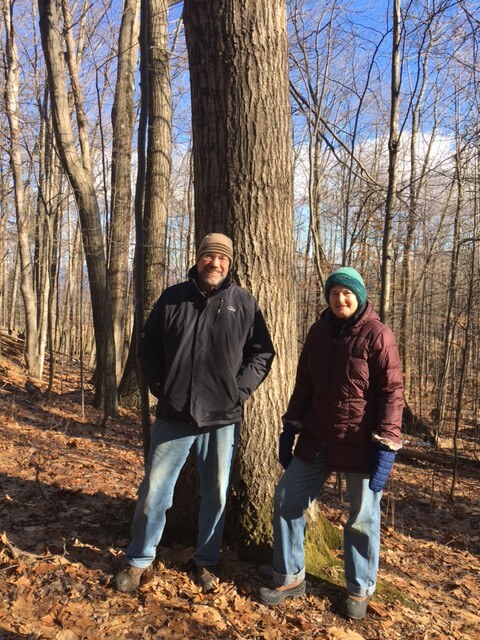 With so many conservation groups working towards a similar goal, a goal the Stones also shared, Dan and Pat immediately decided to participate in the effort and signed up for a bird habitat assessment with an Audubon Vermont biologist. The assessment confirmed much of what the Stones had learned from Kathy and Frank – their land had great potential for bird habitat, supporting the harvest plan Kathy and Frank had outlined. The Stones have now scheduled a small harvest on their land that will create new habitat for birds. The Stones are glad for the people they have met, and the credible guidance they have received. They hope other landowners will see the benefits of working with professionals and take steps to get involved. With their help, they are looking forward to many years of active management where they can make a difference for the birds of Vermont.